With its roots in the traditions of North American indigenous tribes, a totem is an object, usually a representation of an animal or plant, that serves as a revered emblem of a family or clan. Totem animals are used for personal guardianship as well, in which case they are selected individually rather than being passed down through a family, clan or tribe. Various tribes practiced rituals, where a child or young man would suffer some form of deprivation, such as fasting, and the first image that comes the person engaged in the quest would become that person’s guardians spirit forever. It might be an animal, a bird, reptile or insect, and perhaps even an plant. Once recognized, the child and his guardian spirit form a bond, and the totem representing the animal is believed to have influence over natural or magical forces, enhancing power, providing healing, and understanding. Some tribes believed that without the guardian spirit, the person would die. Some tribes held that other guardian spirits might be acquired throughout a lifetime. While generally associated with Native Americans, people from other cultures had similar traditions. For example, the Druids of the British Isle and Northern Europe had animal guides. In recent years, totem animals have been incorporated into various New Age religions and traditions. One New Age text suggests that anyone may determine their totem animal by settling themselves in a place where they will not be disturbed, lighting a candle or burning some incense, closing their eyes, taking several deep breaths and relaxing, then asking for the totem animal to show itself in a vision or in a dream. Frequently, a totem animal will serve as a symbolic object used in order to get in touch with the specific qualities found within an animal that a person might need, connect with, or feel a particular affinity for. In New Age philosophy, a totem animal is used as a guide, for a short time, or throughout the person’s life. Probably, most of us have heard of totem poles, if only from movies and Western novels, and know that they were associated with certain Native American tribes. We may not have noticed what was carved on these totem poles, but the carvings mostly represented animals, although people and supernatural beings may also have been included. Largely, it was the Native American tribes of the Pacific Northwest, in what is now Washington and British Columbia, as well as some of the southern Alaskan tribes, who made totem poles. The tribes of the Southwest, Plains, or Inuit, never built totem poles, contrary to many of the movies we have seen. For one thing, they didn't have trees that were large enough in the desert or Arctic tundra. Totem poles that were made prior to the arrival of Europeans on the continent were smaller than those that were carved later. During the 19th century, they became increasingly larger simply because the acquisition of European woodcarving tools made it possible to form totem poles from single pieces of cedar wood up to forty feet high. 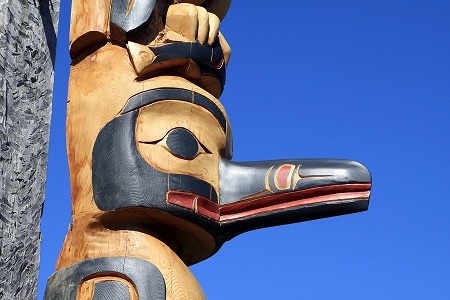 For the most part, the carvings on totem poles represented animals that held significance in Native American tradition, although we may rightly view them as examples of Native American art. Native Americans believed that every creature on the planet is equipped with certain qualities that enable each to face the situations that it will face during its time on earth, and that these qualities are gifts from the Great Spirit. They believe that, at birth, there are energy patterns that form the creature's personality and characteristics. According to Native American tradition, everything in life is a circle. From observation, they saw that the sun and the moon moved in a circle, and that the seasons, too, were circular. On this basis, they created the medicine wheel to represent these circles of life. They believed that everything that might be experienced in life had a place within this medicine wheel, in which everything joined together to form the whole of creation. They believed, also, that the directions -- north, south, east and west -- each had their own presence that exerted an effect on all living things. As these cardinal directions cannot be seen, they were thought to be associated with the winds. The north, south, east, and west winds were represented by a spirit keeper, or animal totem. When the winds blew, they believed that they carried messages from the power of the direction from which they came. North was associated with the power of cleansing, renewal and purity. It was also associated with intelligence and thoughts. The animal totem that represented North was the buffalo, the animal that once provided them with everything that they needed in order to survive. White buffalo were held in the greatest regard. West was associated with the power of transformation, introspection, and grounding. It was also associated with a person's physical body, endurance, and stability. The grizzly bear was the animal totem associated with the West wind. East was associated with the power of light, and the ability to make something known. It was also associated with spirituality and the ability to see the bigger picture. East was represented by the eagle, the bird thought to fly closest to the sun. South was associated with the power of organic growth, discovery, and intuition. This direction was associated with a person's emotions, and was represented by the mouse. Other animals were associated with directional points between these cardinal directions, and Native Americans would turn to these animals for wisdom, connecting with them when they needed to. While differences existed from one tribal tradition to another these animals included the red hawk, beaver, deer, fickler, sturgeon, brown bear, raven, snake, elk, snow goose, otter, and cougar. The directions also represented the times of a person's life, with East being associated with birth, South with youth, West with middle age, and North with the elders. Observing that it took twelve moon cycles (months) to complete the circle of the seasons, these moon cycles were also given a place on the medicine wheel. Each of these moons had an animal, mineral, or plant totem, which had certain qualities that could be passed on to people according to which moon they were born under. Tradition allowed for individuality and growth, however. While two people who were born under the same moon may have a tendency to share certain characteristics, as they lived their lives, they would move along the wheel and experience the traits of other totems at different points of their lives, and were capable of taking on other traits, or being guided by animal spirits other than those they were born under. Today, while these traditions may yet exist among certain Native American groups or individuals, they have also been taken up by the New Age movement, who may use the trappings of animal totems as spirit guides. Under the premise that animal totems offer a link to the inner self, and to the spirit world, the site offers animal totems for sale. Its products may be found alphabetically or by category, which includes animals, birds, reptiles, aquatic, and insects. The meanings and symbolism behind each is stated, and a discussion of various messages is presented. Native American, Celtic, Indian, Greek, Roman, Chinese, and Biblical symbolisms are included. George Gulli of Victor, Montana is a second-generation totem pole carver who adheres to the style of Native American totem carving, and particularly the traditional Pacific Northwest Coast Native American style. Totem poles may be special ordered, along with signs, wildlife statues, and whimsical wood carvings. An introduction to the artist, a photo gallery of his work, and a history of totem poles are presented. Authored and maintained by Beverly Owens, the site offers information on various animal totems, including birth totems and elemental influences, as well as the medicine given to human beings by the animal totems from the Native American spiritual perspective. Plant and mineral totems are also featured. Other topics include Native American crafts, prophecies, tribal lore and history, spiritual and physical remedies are also discussed. Presented by Native Languages of the Americas, a non-profit organization dedicated to preserving endangered Native American languages, the site gives several examples and discusses the totem poles of the Indian tribes of the Pacific Northwest Coast and some of the Southern Alaskan tribes, and offers a list of individuals and businesses from whom a totem pole made by an actual Native American may be purchased. Located in Estacada, Oregon, John Birchfield has been has been hand carving and creating totem poles since 2002, and also offers ceremonial masks that represent the Great Spirit of which Native Americans used to tell family history and tribal stories. An introduction to the artist is featured, and a gallery of photographs depict samples of his work. His location is shown on a map, and those interested in commissioning or purchasing his work may contact him via an online form. Intended to encourage the interest of children in totem pole art and Native American cultures, there are many whimsical designs of commonly known birds, insects, and animals, as well as more traditional Native American designs, often based on photographs of existing totem pole art. Also available are coloring books, window decals, gift wrap and other paper crafts. The totem pole designs might also be used as patterns for skill saw carvings. From Star House in Massett village on the Queen Charlotte Islands, Canada, the totem pole is the largest object displayed in the museum. Carved from red cedar, hollowed out at the back before carving for the ease of transport, the pole is well documented in its original village, standing outside the home of Chief Anetlas, who lived from 1816 to 1893. The pole was donated to the museum in 1901 after being purchased for $36.00. This guide adopts a contemporary perspective on the subject of spirit animals, based on modern principles of psychology and intuitive work. Mystical and spiritual meanings, traditions and characteristics of various animals are defined, as well as the relationships of human being with them as spirit guides and totems. A spirit animal quiz designed to help someone determine what their spirit animal might be is included, along with information about other ways that might find their spirit animal. The membership site is focused on Animal tokens, and includes areas that are accessible to anyone as well as those that are restricted to logged in members. An alphabetical listing of animal tokens leads to discussion forum for each, as well as featuring members who identify with each listed totem. Photographs, video, blogs, and an online forum are featured, with a calendar of events and chat area. Membership is free. A list of totem animals a in alphabetical order, including their meanings and symbology, and how to apply their wisdom to your daily life. Documentary videos are available for some. Methods by which one can identify their animal totem is included, as well as those that may elicit a negative response, known as shadow totems, and how to identify them. Free totem readings and a blog are included. Hoping to create connections with wildlife and nature, the site encourages people to choose a wildlife totem as a symbol of their interrelation to nature and to incorporate it into their lives. Wildlife totems may also be chosen for children or grandchildren. After choosing a totem, a certificate of connection, describing the characteristics of their chosen animal, is offered. A section of fun things to do with your totem are included. Search for Totems on Google, Bing, or Yahoo!